..with composer/narrator Alison Bauld, Sally Burgess mezzo-soprano, Piers Lane, solo piano and with Kathron Sturrock, piano duet. Exhibition Hall, Australia House, Strand, London WC2. A concert inspired by the new novel 'Mozart's Sister' by Alison Bauld. 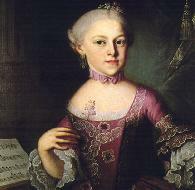 Entries from Nannerl's diary will be narrated in alternation with Mozart arias, piano sonatas and several staged arias for mezzo-soprano and piano composed by Alison Bauld in homage to Nannerl Mozart. Interwoven diary entries give dramatic shape to the music as Nannerl's life unfolds.